CNN photojournalist Giaco Riggs took a few pictures of a Red Fox in pursuit of squirrels on Capitol Hill last Friday. "It just showed up and was hunting a squirrel," Riggs was quoted by CNN as saying. "When he showed up, all the other squirrels ran away. When the fox went away, all the squirrels came back." 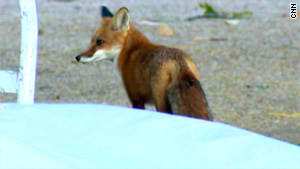 Riggs was on a stake out shoot of the Capitol when the fox appeared. CNN's Bob Kovach ended his story with a lame duck joke, perhaps out of professional courtesy for rival FOX News. It's good to know that even CNN resorts to "I saw a dog today!" on a slow news day. Whoops - your link to the "Capitol Hill" wiki article is broken here and on LJ. Fixed, thanks. LJ should update eventually. Since Republicans won the Hill back, I guess the Fox has to chase after something on Capitol Hill since it's okay with the politicians there. OMG a fox!!! There's a person getting raped, but the fox is more important!!! People get raped all the time in DC. It's called "politics". No really? I didn't know. Thank you so very much for clearing that up. There is no evidence for this statement. but the fox is more important!!! You so funny. I'll throw in 'lol' just for you. I'm not sure this level of hostility is warranted from some cute animal pics.